As one of the world’s most-rated watchmaker, Rolex has been able to cater to its consumers aptly and precisely. Across its various watch models, the Rolex Hulk Submariner 116610LV has recently been one of the Swiss brand’s bestsellers. Following its superlative design which presents its wearer with exquisite accuracy even when at the deep blue water of the sea. Essentially, the first submariner was introduced in 1953 as a divers’ wristwatch. Though it wasn’t the first model by Rolex to possess technical proficiency of waterproofness. The timepiece, natheless, was more efficient than the first waterproof Oyster as it could be used underwater at up to 330 feet depth flawlessly. After various advancements, in several models of the Submariner, Rolex 16610LV was introduced in 2003 as a symbol to help mark the 50thbirthday of the Rolex Submariner collection. Branded “Kermit”, the wristwatch featured a green bezel and also it was equipped with the “Maxi” dial which was discontinued around 1984. During the Baselworld 2010, Rolex presented an upgrade of the Anniversary 116610LV Rolex watch, featuring a thicker case structure and vibrant green bezel and dial. In no time, the watch was dubbed the “Rolex Hulk” (from the thick green fictional monstrous Hulk from the Marvel comics). Since the introduction of the Submariner, Rolex has never installed any of the included models with flashy colors. Making the two Rolex Submariner Green watches the only models, which was later maximally enhanced by the Rolex Hulk. To ensure the 116610LV flair was for a lifetime, Rolex has been using Oystersteel (904L steel family) on the wristwatch’s versions. Following its high resistance to corrosion and its ability to retain an exceptional shine after it has been polished. Due to this attribute, Rolex 116610LV watches are able to survive harsh environments without losing their elegance. Or even exposing the equipped high-precision movement to perilous adulterants such as dust, shocks, pressure, and even water (though up to 1000 feet depth). This is as a measure to help the Rolex community in distinguishing between the 2003 Rolex 16610LV and the Rolex Hulk. The latter has been fitted with a thicker middle case which has the lugs with a width that’s almost twice of the former Rolex Submariner model. Additionally, the winding crown is also thicker and equipped with the Triplock triple impermeability system that guarantees the Rolex dive watch watertight security after screwing it down fully. Functional and elegant. The dial of 2010’s Rolex 116610LV is the major attribute that has made the timepiece the bestselling model in recent years. Due to its unique and arresting makeup which is composed of bright green color, alongside “Maxi” dial setting. In ensuring the desired perfection is maintained, the green dial of the 116610LV watch, just as with the rest of Rolex’s dials, has been created extensively by hand using the company’s in-house team. To enhance the readability of the timepiece, the hour markers and the hands of the Rolex Submariner Green are larger and designed using 18ct gold which prevents them from tarnishing. Additionally, the added Chromalight helps enhance their readability even in the deepest sea depths, where the waters are totally dark. Rotatable and green as well, the unidirectional bezel of the Rolex Hulkhas been creatively designed to ensure it’s both durable and ultimately supportive to the divers. Using the 60-minute graduations which have been deeply etched on its sturdy Cerachrom material, which is practically scratchproof and highly resistant to corrosion. To ensure the deep divers are able to track their diving time, as well as the decompression stop with exquisite accuracy, on the zero marker of Rolex 116610LV bezel. There is a luminescent capsule which has been added to improve legibility in dark environments. And also the edge has been knurled to ensure the bezel has got an excellent grip while under water. In providing its wearer with high-precision, Rolex Submariner Green has been installed with a caliber 3135 self-winding movement which has been developed entirely in-house by Rolex. Qualified and certified as a Swiss chronometer by the COSC, this perpetual movement has been fitted with blue Parachrom hairspring which is intensively paramagnetic. And also with outstanding stability (ideal for variant temperatures) and higher accuracy (up to 10 times more) than the traditional hairspring when both are exposed to shocks. Equipped with 31 jewels, Rolex 116610LV caliber 3135 is singularly reliable, following its 48 power reserve. Even after offering 8 beats per second. For optimum uniformity with the Oystersteel case, Rolex 116610LV is composed of Oyster bracelet which has been ingeniously created to present the wristwatch’s wearer with a remarkable functionality. And brilliant elegance, following its supreme alchemy which has been set for ultra-coziness and robustness. For the ease of use, the Rolex Hulk bracelet has been equipped with a smart Glidelock which allows the watch wearer to make fine adjustments on the bracelet. While using no tools. This adjustment is really essential (particularly on wetsuit) so as to ensure it perfectly and securely fits after fastening with the equipped foldingOysterlocksafety clasp. During the assembling of the Rolex Hulk model, the brand’s artisans usually conduct the process diligently and artfully to ensure the timepiece presents you with an exhilarating experience. Whether you are a professional diver like the Guinness World Record holder, Ahmed Gabr, or you are just a dive enthusiast. The Rolex Hulk has a Chromalight display which provides a long-lasting blue luminescence. 904L Oystersteel is a sturdy non-corrosive material, thus durable and anti-fade. The Sapphire Crystal used is Scratch-resistant and strong, keeping out water up to a pressure of around 30 atm. With its equipped caliber 3135, Rolex Hulk is able to provide several functions of time, including hour & minutes and instantaneous quick-to-reset date under the Cyclops lens. The iconic timepiece runs by bidirectional self-winding using its perpetual rotor. Although Rolex Company broke its traditional norm of avoiding “flashy” colors on its iconic watch collections like the Rolex Submariner. 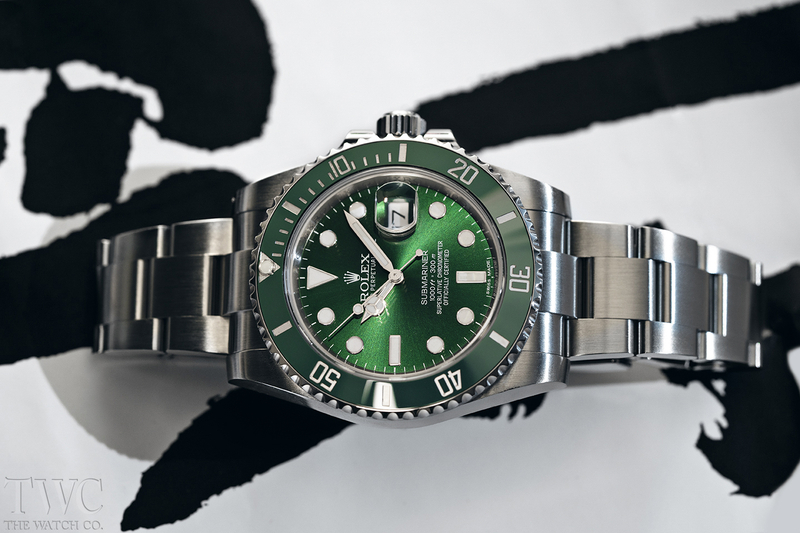 Rolex Hulk Submariner 116610LV, undeniably, has added a unique shine on the Swiss brand’s diving collection. The Rolex Submariner green watch is allowing its wearer to not only enjoy its versatility but also stand out distinguishably from the blued and the black submariners like the Rolex 116610LN.